Retrax One is a retractable truck bed cover from 1996-founded Retrax that features matte finish and built-in Trax Rail System. The system boosts cargo capacity above/below the cover and is compatible with T-slot accessories from third-party manufacturers like Rhino Rack and Yakima. What are the features of Retrax One? What to Expect from Retrax One? Who Is Retrax One for? How to Install Retrax One? What is the alternative to Retrax One? This isn’t a “cheap” truck bed cover but provides high value for the price range. The one-piece carbonate construction helps prevent dust and water from getting into the components. The cover is loaded with features like Trax Rail System, low-profile design, and cargo management. Compact Storage Canister: This is almost 1-foot squared and contains a spiral track system to keep the truck bed cover from contacting itself when it opens/closes. 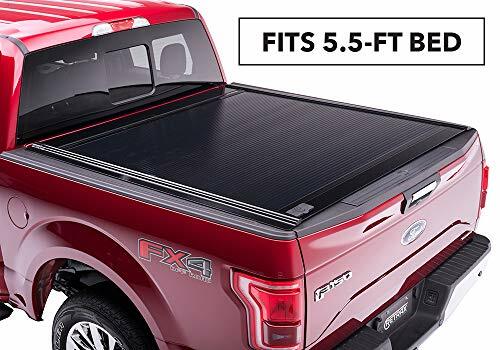 Durable Construction: The truck bed cover is made of durable polycarbonate and includes a scratch-resistant matte finish. The one-piece polycarbonate sheet retracts without hinges/joints, so dust/water aren’t trapped in. These features help to maximize the cover’s strength and durability, which in turn boosts the lifespan. Trax Rail System: This allows for accessory customization and boosted cargo capacity above/below the truck cover. It works with T-slot accessories from Rhino Rack, Thule, Yakima, etc. Ball-Bearing Rolling Design: The ball-bearing rollers are sealed/mounted to the aluminum support beams. This allows the RetraxOne truck bed cover to retract/close without springs easily. There are also no moving parts that can jam or freeze. Key-lockable: Retrax One can be locked in any position. This helps to safeguard any cargo you’re hauling with your truck and helps protect your investment. Cargo Capacity Maximization: The cover is fully functional when cargo is loaded above. It also maximizes the cargo capacity whether the cover is open/closed, which improves cargo management. The unit’s capacity is also increased when pairing it with accessories. Lifetime Warranty: The RetraxOne is covered by a Limited Lifetime Warranty. It’s important to read the terms & conditions, so you’ll know exactly what is and isn’t covered by the warranty. Flexible Hitch: Freeing up the hitch allows you to mount bikes, outdoor gear, coolers, etc. on the bed cover’s top. That’s done by combining the T-Slot accessories and Trax Rail system. Low-profile Design: This makes the retractable truck bed cover look more streamlined and creates a strong seal around the truck bed’s perimeter. It also helps to keep moisture out of the truck bed, which protects your vehicle and cargo. Retrax One is a quality retractable truck bed. It’s not a budget cover but provides high quality and functionality. If you want to protect your truck bed and cargo, then this is a good option. It’s loaded with features like Trax Rail System to boost cargo capacity, one-piece polycarbonate without hinges/joints, and low-profile design for better water-resistance and aesthetics. If you want to improve your truck’s cargo management, then you should certainly consider RetraxOne. It optimizes the cargo capacity and can actually increase the amount of cargo you can haul with your truck. Even when there’s cargo above the cover, the unit is still fully functional. Another way you can boost the truck’s cargo capacity is by using T-slot accesses from companies like Rhino Rack and Yakima. On the other hand, if you’re looking for a budget truck bed cover, then you probably shouldn’t consider RetraxOne. You can find other covers in the $100-$200 price range that are functional yet offer few perks vs. Retrax units. If you’re on a shoestring budget or simply don’t need a high-end retractable truck cover, then a budget cover might be the best option for you. Here’s a video about how to install a Retrax One cover. If you’re looking for an alternative to RetraxOne, we recommend the Gatortrax Retractable Tonneau Cover by Gator Covers. The unit is priced similarly to RetraxOne and includes many of the same features as well. That includes the product’s materials like polycarbonate. The cover can withstand evenly-distributed 300 pounds of cargo. That includes items like dirt bikes, golf clubs, and construction equipment. Like the Retrax cover, this one is also has lockable feature, 11-inch canister, sealed ball bearings, and limited lifetime warranty. The Gatortrax cover is very safe/secure. After you’ve locked the cover and tailgate the truck bed is actually safer than the cab. This is important whether you’re hauling equipment for work or play. Other features include the maintenance-free sealed ball bearings that make it a cinch to open/close the cover. The clamp-on rails are easy to install and require no drilling/cutting. There’s also the compact canister that maximizes the truck bed’s usage. The Gatortrax is also available in various styles. They include Gloss and Matte depending on whether you want a cover that’s flat or shiny. While this unit is quite durable, it’s also protected by a limited lifetime warranty. Make sure to read the terms & agreements, so you’ll know what it does and doesn’t include. If you’re in the market for a retractable truck bed cover, you have many options. It can be tough to sort through them but the Retrax One It’s definitely one of the best options. This isn’t a “cheap” truck cover but can be a worthwhile investment for your truck and cargo. It’s quite durable due to features like aluminum lamination that and scratch-resistance provides extra protection for your cargo. It’s also protected from rain due to the low-profile, and from potential thieves due to the lock. The RetraxOne is also easy to install and open/close. It also boosts your cargo capacity with the Trax Rail System and third-party accessories. Other features include better hitch functionality, sealed ball-bearing rollers, and lifetime limited warranty. The Retrax One has you and your truck bed covered! Truxedo Titanium Review : Worth Buying? We are here to help you when it comes to bike racks, tonneau covers, towing and winch equipment! Choosing right item without guidance could be a hassle. Our expert team will guide you with reviews and help you make informed decisions.